Dental veneers can create a beautiful smile while ensuring a natural look. 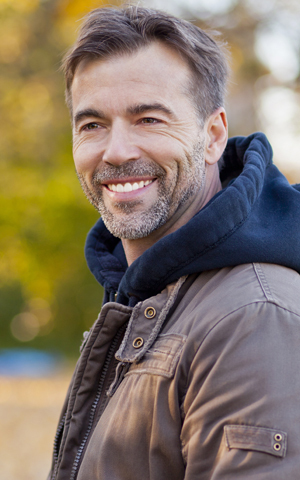 If you want to revitalize your smile, dental veneers at Hammons Family Dental are a great option available to you. Patients interested in making over their smile with veneers should find an experienced dentist who cares about their smile goals. Dr. Hammons listens to your smile goals and can help you achieve them with dental veneers! Dental veneers are thin shells that are placed over the existing teeth. Each shell is designed to perfect the shape, size, and color of the natural tooth. The veneer bonds to the surface of the tooth to cover a variety of flaws. The translucent layer of material that composes each dental veneer is usually made of beautiful porcelain. We will fit your veneer precisely over your tooth using durable bonding and high-quality materials. Most patients are candidates for beautiful smiles with dental veneers. During your initial visit, Dr. Hammons will assess your dental health and describe your options for improving your smile. He will study both your teeth and your overall facial anatomy to help you make the best decision. We work alongside our patients to give them excellent results. Contact Dr. Hammons today to learn more about how we design dazzling dental veneers in Austin.